St. Charles is a Chicago suburb in Kane and DuPage counties of Illinois, and is roughly 40 miles west of Chicago . According to a U.S. Census Bureau in July 2012, the city has a total population of 33,327. 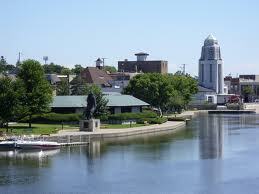 The official city slogan is Pride of the Fox, after the Fox River that runs through the center of town. St. Charles is part of a tri-city area along with Geneva and Batavia, all western suburbs of similar size. St. Charles was also the place of settlement for diverse groups of European immigrants, including those from Ireland and Sweden during the 1840s and 1950s, and later, groups from Belgium and Lithuania. Several “stations” of the slavery-era Underground Railroad were in St. Charles homes, complete with tunnels and false doorways; there was also an open abolitionist group called the Kane County Anti-Slavery Society, founded in 1842, with about 180 members. Home of the Kane County Fair Grounds is the famous Kane County Flea Market held the first Sunday and preceding Saturday of every month. Downtown St. Charles’ Lincoln Park serves as the central location for two annual citywide events: the Pride of the Fox River Fest in June, and the Scarecrow Festival in October. Saint Charles is also home to the Arcada Theatre, a notable attraction within the Fox River valley, where many famous performers have appeared including Martin Short, Joan Rivers, and Bill Cosby. Downtown St. Charles was named one of the region’s “Top 10” by the Chicago Tribune for fine dining, arts and entertainment, recreational opportunities, unique shopping, and a lively nighttime personality. Family Circle magazine named St. Charles #1 in its 2011 Annual Survey of Best Towns and Cities for families. The comprehensive survey included communities from across the country and is featured in the magazine’s August 2011 issue. The communities named in the magazine’s annual roundup of perfect places to call home, combine affordable housing, good neighbors, green spaces, strong public school systems and giving spirits. The St. CharlesHeritageCenter maintains two small museums in historic local buildings. The St. Charles Public Library is nationally ranked among the best libraries in the U.S. and has earned a “three star” rating in the 2010 Library Journal Index.